A mother of four who had decided to have a fifth child, has gotten a beautiful surprise after she gave birth to triplets. 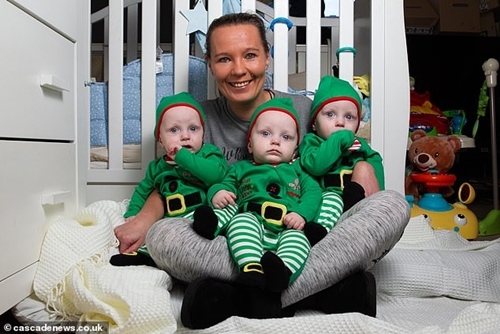 The mother and her kids A mother is looking forward to her first proper Christmas with her seven children after spending last December in hospital with her surprise triplets, Dailymail UK reports. 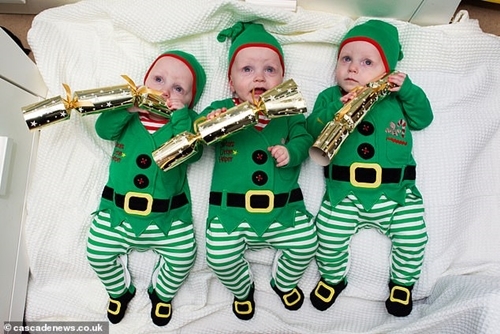 Identical triplets – Thai, Tyler and Tomas were conceived naturally – at odds of 160,000 to one – after Mary McCandlish, 36, from Barrhead in East Renfrewshire decided she wanted one last baby to add to her family of four. Mary had Thai, Tyler and Tomas by Cesarean section last October weighing just 3lbs, 21bs and 1lb. After spending last Christmas at Queen Elizabeth University Hospital in Glasgow, while the boys were fighting for their lives in an incubator, Mary is looking forward to their first Christmas at home. This year they’ll be at home with big brothers Peter, 17, Emily, 15, James, seven, and sister Katrina, 14. ‘We spent last Christmas sitting around three little incubators watching the boys fight to survive,‘ said Mary. 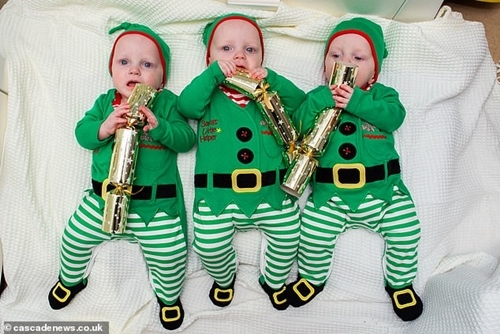 ‘My triplets were born 10 weeks early by cesarean section after doctors decided it would be too risky for the pregnancy to continue. I am just 5ft 1in and felt I had done well to get to 30 weeks in pregnancy. 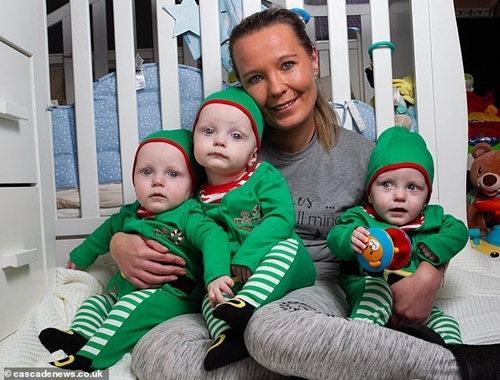 ‘The boys were running out of space in the womb and doctors wanted to give them the best chance to survive.‘The baby boys had to be delivered 10 weeks early as doctors feared they would not continue to thrive in the womb much longer. They were all linked to the same placenta which struggles to feed babies after 30 weeks.’ Premature babies’ lungs are not fully developed enough to breathe on their own and it is vital for them to work well enough to get oxygenated blood to their brains and the rest of their bodies. But earlier this year, after 10 weeks in hospital, the boys were allowed home to join their four big brothers and sisters at home. Thai arrived home first, followed by Tyler and then Tomas. Mary says she this will be the best Christmas ever for the family. ‘It will be one of the busiest in any home in the country, I’ll bet. Led with laughter and fun, the way any family’s should be. The older kids will be playing with mobile phones and the triplets will probably abandon their toys and want to play with the boxes.’ The bond between the triplets is a close one. Mary says they only have to look at one another and they burst into giggles.